Just watching the BBC news and the presenters had a brief chat about which biscuit is best. We have this discussion at the stables all the time. They decided hob-nobs, but I don't agree. They're too bitty for me and you get left with oats and sawdust in your mouth long after the biscuit pleasure has passed. Peter Kay does a hilarious sketch about the 'hob-nob' (dunk me again!). If pushed I would have to say my all time favourite is the lemon puff (haven't seen one for a long time) followed by custard creams and jaffa cakes, and maybe jammy dodgers. We take it in turns to buy biscuits for the stables. Well, some of us do. As in all things there are those of us who buy them regularly, and those who never buy them. This discrepancy disappears miraculously when it comes to eating them. We all take our fair turn at that!!! I'd really like to know who is in charge of the weather. Last week we had 28 degrees and beautiful sunshine. Today the forecast says 8 degrees and 23mph winds. Whoever is in charge is not doing a great job are they? If they worked for me they would be getting the sack or at least a serious disciplinary. If you paid a monthly subscription for the weather you'd be looking for another service provider, or at least on the 'phone to customer services asking for a reduction in your direct debit. Isn't the weather supposed to follow some kind of pattern or trend, so once it starts to get warm and sunny it's meant to stay that way for a while (give or take the odd day of rain)? It's glorious June in 3 days and we've got early March weather. I've now got to crawl about in the back of the wardrobe and get out my winter warm riding clothes that I had put away!! It's probably my fault for driving a 4x4. Update I have just come back from the stables - it's 11.32 am and I had to come home because I couldn't stand the cold a moment longer. As I am now officially a southern softy I simply cannot handle the cold. It's absolutely bloody freezing - I could see my breath in the air. For goodness sake!!!!! The mad ranting woman from the next door stable yard has done a dastardly thing. She has built a pen next to our outdoor menage (fenced area in which we school our horses) in which to keep goats. Goats are very cute, but bleat and leap about a lot and therefore scare the living crap out of horses. Needless to say my 'ride with your mind' lesson didn't go that well yesterday. (I couldn't possibly tell you that Phoebe was a bit naughty and I nearly ended up in tears!). We've all had goat-related near misses this week!!! I can't imagine why she has sited the goat pen next to our outdoor menage and not her own...probably because the parents of the children she teaches would sue her if one of their 'little darlings' were to fall off because of a goat-scare. Anyway Phoebe's goat de-sensitising programme continues tomorrow! I'll be the one wearing the dark brown jodphurs! When you have 'man-flu' and can't really taste your food, and your appetite leaves you - try eating 3 M&S individual luxury sherry trifles. I feel better already. Today it has rained all day and the temperature has dropped to November type cold. My man-flu is getting worse despite having spent twenty quid at Tesco on medicines and kleenex balsam ('spoil-me') tissues. But it's okay because early on Tuesday I'm flying out to Puerto Banus for two days. Dan is there with her Dad at the moment and they phoned me this morning and insisted that I fly out and join them. Well, who am I to argue with that? I have been told that I don't need much luggage as they have all the toiletries, make-up, hairdryers that anyone can ever need, so can I fit two pairs of shorts, two t-shirts, and clean knickers in hand luggage - you bet I can!!! Emma at the stables has kindly agreed to babysit Phoebe and Bugsy and Jo is coming over to feed Fifi (killer cat). So even if the rest of England has rain all week, at least I shall get 2 days of sunshine. I'm sorry to let you all know that Rachel didn't make it. The vet and I decided that she was probably never going to regain the use of her front legs. The kindest thing was to put her to sleep. So Rachel has now gone to big bunny heaven in the sky. Her last snack were Marks & Spencer best Chanteney carrots. This morning I have woken up with sore throat (swallowing glass - ouch) and runny nose. The rabbit is going for what I think will be her final visit to the vets - she still can't stand up on her own and spends all her time falling over (after I've set her back on her feet). In addition to that I've just checked the website for the organisation that I've recently sent £100 to for four tickets to see a dressage demonstration for 6th June - only to see that they've changed the date to tomorrow. No phone call, nothing - just a crap one line on their website. If I want a refund I have to have phoned them before the end of business yesterday - I can feel a fight coming on, oh yes and now it's bouncing it down with rain. I've got a feeling that today is going to be one of those days. This morning, for the first time, I've stood Rachel up on her four feet, and she hasn't toppled over!!! I think if she tries to move she probably will fall over - but right now she's happily watching the world from a normal position instead of on her side!!! Progress! So it might not be bad news tomorrow after all. I was just talking to Christian on MSN (I think he should be working?) and Phil was sending him links to send to me. Christian was asking me how Rachel was doing, and then he sent me this. I think they're horrid. The vet and I are becoming good friends. Rachel is improving - but still not able to use her front legs. We had a bit of a decision to make at the vets this morning. The vet thinks that there is probable nerve damage where the cat would have picked her up at the back of the neck. We decided to give her until saturday morning, and then if she's not better we will do the kindest thing. Come on Rachel. I've just fed and cleaned Rachel. She must be feeling better as she's kicking big time with her strong little back legs, it was difficult to hold her steady. Her front legs are still not right and she can't stand by herself yet. But there's nothing wrong with her mouth. She just bit me...OUCH!! There's this mad woman I know - come to think of it I know a few! When I say she's mad I mean that she's volatile and gets angry very quickly for no real reason. Quite frankly at her age (late 40's) she should know better. She runs the stable yard and riding school next door to our stables. Since we've been there (17 months) she's had a go at me twice before. Both times for - in her opinion - driving down the lane too fast. When she has a go she goes off at an alarming rate and screams and shouts and generally tries to bully her victim into submission. Well, as you can imagine, that wouldn't work with me! I wait for her rant to finish then calmly explain that I wasn't driving too fast and then politely request that the next time she talks to me to please do it in a civilized manner. Everyone who knows her has been at the sharp end of her tongue at some point and they all share the same opinion of her. (she's nuts!) Most of her victims are children and teenagers who don't have the necessary skills and experience to deflect such aggression. So her behaviour for the most part, works for her. As I said, the woman is a bully. Yesterday she was having a go (foaming at the mouth, wailing like a banshee) at one of my friends and I just happened to be standing near the gate looking for Emma at the time. She saw me and started having a go at me too!!! I told her to 'wind her neck in' (great northern phrase). Now I don't know what had upset her but it surely wasn't me, so I didn't really see why I should take a volley of abuse! The outcome of all this is that she has stated that I can no longer use the lane which leads to our stables (she owns it). Nobody else, just me. It doesn't matter as there is another entrance which she doesn't own which I can use - but the injustice of it has really annoyed me. So here's a little message for her..."Bev, of Weybridge Equestrian Centre...I think you are a nutter. I think that you need some professional help with your temper. I think you are rude and aggressive, and a bit of a bully. I also think that you should be very grateful for the fact that you have a great life living in a fabulous place and spending all your time looking after animals. Today is a lovely sunny day, and you should take a moment to go outside and smell the clean air that surrounds you. ...then you should calm down and come and apologise to me"
I know that she won't, and I feel a bit sorry for her - as it can't be nice walking around with all that aggression running through your veins, but I feel better for having written this!!! I wouldn't dare say it to her face as quite frankly she scares me a little! We're back from the vets. He didn't think anything was broken and has given us some special food to feed her. We've got to give her some TLC and take her back tomorrow morning to see if she's improved. Oh yes, she had an injection (tiny needle) of painkillers and antibiotics. The vet said that she was only a couple of weeks old. Bless!!! Update: 12.32pm - Rachel has done a small poo! I've made an appointment at the vets for 10am. She survived the night and has had some more apple and water this morning. Fingers crossed. Fifi - the killer cat - has struck again. This time it's a tiny little rabbit who she has injured. Dan found her in the hall earlier and brought her to me. It's a little female rabbit who we've christened Rachel, and she's only about 7 inches long. She's got an injured shoulder / front leg which she can't put to the floor. We've wrapped her in towels and put her in a box. She's had a drink of water via a little pipette - she was quite thirsty!!! And she's also had some tiny little pieces of apple. She's asleep now - but if she makes it through the night I'm taking her to the vet first thing in the morning to see if she can be saved. Fingers crossed. I know it's only nature that makes Fifi go out on the prowl and kill and injure all these creatures, but I wish that she could be a little less aggressive. It's not as if she's hungry. Nature is quite wonderful - but can also be quite cruel. Every day I read Christian's blog (in my opinion he's not a very prolific writer!) and then I use the links on his blog to read what Oboe Jane and Rachel are up to, and now Victoria too. Jane lives in London and Rachel is up in Bonny Scotland, whilst Victoria resides in Dronfield. I like to read what these ladies have to say and their posts are entertaining and funny. I have never met these ladies (apart from Victoria), and before I started reading their missives I didn't even know they existed. Now we regularly put comments on each other's blogs, and have become almost like 'virtual' friends. Because of this I have added links to their blogs so that you too can read what they have to say. I hope you enjoy their stuff as much as I do. I've also added a link to "Hot Phil's" blog - but that's out of good manners as he was kind enough to put a link to my blog on his blog - so I thought I'd repay the compliment. Mind you - his blog is funny and entertaining too!! Phoebe was a bit off colour yesterday. She hadn't eaten all her night time haynet (never been known before as she's a tad greedy). She was 'tucked-up' which basically means that her tummy was a bit pulled up, she'd been chewing her flanks and she looked a bit forlorn with her head hanging over the stable door. Now, I have a full equine first aid kit including stethoscope and thermometer - so I listened to her digestive sounds (biggest killer of horses is colic - equine tummy ache, usually cause by intestinal blockages) and everything was gurgling away nicely. Then I took her temperature. This includes lifting the tail and poking the instrument up her bottom - the look on her face was priceless(!). Her temperature was also normal. As I was mucking her out I managed to stab the sharp prong of the shavings fork in her foot and there was a little bleeding (Sorry, sorry). Anyway, by teatime she was much better - but her stable looked like it had been used by an elephant. If that amount of 'poo' needed to come out - there's no wonder that she had a tummy ache!!!! If anyone is growing rhubarb this summer and would like some first class horse manure - just give me a shout!!! I don't think horses go out for curries, but if they did she probably had a vindaloo!!! At Age 80.....Success is... Not peeing in your pants. As for me; all I can say: Man .... what a life.. I am busily writing a new 'Induction' course for new starters at work. I have to make a powerpoint presentation and include all the departments. To prevent it from being boring ...yawn... I have decided to take photographs of each department head and include them in the slide. I e mailed everyone concerned today to let them know that I will be taking the pics on Wednesday. (Thought they may like to ensure that their hair is clean etc!) and you cannot imagine the ensuing panic!!! Hilarious. Last year, about this time, I came home from work to find that my living room and bedroom had been infested by these, and when I say infested I mean many thousands of the bloody things crawling all over everything. Obviously I freaked out big time, and then got the Dyson and hoovered them all up the tube (quite a satisfying feeling). When I came home again later, they had arrived again, and once more they met their Dyson fate. The whole thing carried on for about 36 hours, and then, as soon as they had arrived, they departed. Anyway, this year I am prepared and have been waiting for them. They're a little later this year, but tonight as I sat watching 'The Best of Top Gear', one landed on me, and I looked around the room and there were about 8 of the little blighters flying around the room. Today I had to go to Curry's and get a new Kettle for Dan's Dad. He was hosting a meeting at the house and his kettle wasn't working. 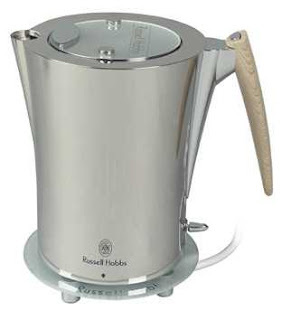 I thought that this kettle had just come from an episode of "pimp my kettle". I liked it so much that I bought myself one too!!! This photo doesn't really do it justice but it sits on a shiny glass plate and it is really a very attractive kettle! I went and got a digital radio today. The sound quality is absolutely amazing. It's at the side of my bed and it has an alarm clock feature. You don't need an antennae (although it has one), and it is really easy to use. If you've been thinking of getting one - then go ahead - I promise you won't be disappointed. I've got mine back. Freedom I mean. After 17 and a half years of being tied to Dan (Mum's taxi) now that she can drive and we've got her the little green pea, she's off out and about on her own. This morning she came into my room and told me to have a lie-in because she was going down to the stables to do the horses. BLISS!!! (seeing as I had hangover from hell). Tonight she's gone out to a barbecue with some friends, and I've got a cosy night in with the TV remote all to myself!!! To all you parents who think that the ferrying around is never ending - believe me - get them through their driving test as soon as you can - and then you too can have your life back!! Last night she drove me to Tesco - very well I may say. When we got home it was just going dark so I suggested that she drive round the estate on her own in the dusk to get used to being alone in the car. She came home unscathed half an hour later, and then this morning she has taken herself off to school, and then to the stables..in rush hour traffic !!! I advised her to park the car by reversing into spaces if she can - and then getting out again later when the car park is fuller would be much easier. So far so good. I'm at home today finally doing my 2006 tax return which should have been with the IR (bastards) in January. They phoned me yesterday to find out where it was - so I thought I'd better get on with it. I have been to M&S to buy food, then popped into Currys and nearly bought a DAB radio, but then got confused and left empty handed. 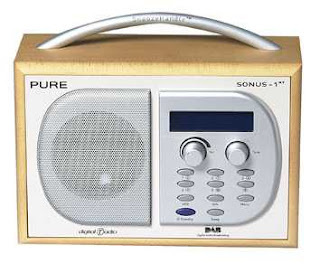 I have no idea which DAB radio to buy - any suggestions from techno geeks that read my blog? Christian? On Friday we're going to Badminton - to the Horse trials. Very exciting! Dan's Dad is coming too. He'll be asking lots of "I need to gain more understanding" questions, which will give me a headache! But never mind, because there's a huge shopping village. ..."my knee is really bad"...., ..." I won't be in the country in April"....., etc. A couple of the Marathon excuses I've heard this week. Really people, it's okay - nobody has to do the Marathon with me - I'm more than happy to do it by myself - well obviously not really by myself as there will be another 15,000 people running on the day, but you know what I mean. Why is it that when you decided to do something worthwhile, everyone assumes that you expect them to be doing it too, and they must think of an excuse - quickly - as to why they can't? I don't expect anyone to do what I do, so - everyone else is off the hook. Huge sigh of relief all round ! Just in case you were wondering - I'm still not smoking. It is getting easier each day - but that might be because my determination increases with each day that I manage not to smoke. It's not as hard as I thought it would be - although Saturday and Sunday were quite bad. I cannot wait for somebody to offer me a cigarette and for me to be able to turn around and say ...."Oh ...No Thankyou, I don't smoke!" I have been smoking since I was 13 - that's 30 years...Good Lord, that's appalling. I didn't even stop smoking whilst I was pregnant - doubly appalling. (although I did cut down considerably). Last weekend when the ladies were here I watched all 3 of them smoking and just decided that it wasn't for me anymore. Just like that. After all these years. What? the Nicotine starvation has finally addled her brain!!!! No. No. It's okay - really.....Yesterday I went to Sheffield on the train to bring back the pea. The Pea is a little bright green Ford Ka which I have owned and driven since the year 2001. I love that little car - it's never broken down on me and it's very nippy, economical and it has a rather cool 10 disc CD player. Anyway, it's been living at Gary's house since we left Sheffield 18 months ago, and yesterday I had to go fetch it back as it's booked in for an MOT this morning. Gary has looked after it for me and it started first time!!! (BIG THANKYOU GARY!) It is nice and clean, and during the drive back down to Surrey yesterday afternoon I listened to Tom Jones' greatest hits on the CD player - bliss!!! I also threw a cup of over-priced railway station capuchino all over my white t shirt at St Pancras station - so by the time I got to Chesterfield I looked like a pikey. Last night Dan got behind the wheel and drove me round the estate here - I thought I'd be scared but actually she's quite good and adapted to the Ka straight away - previously she's only driven a Fiesta. So Hopefully if the KA passes its MOT today she'll be driving it by tea time and I will get my life and my freedom back!!! All we have to do now is think of a name for the little green Ka. All suggestions gratefully received!! !